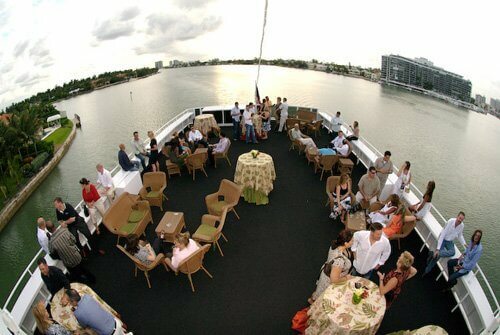 Start making plans for your next party with a Miami yacht rental. To plan a Miami yacht rental with us, the first thing you should do is prepare your guest list for an approximate count of guests. This will help you when you have to select resources and one of our gorgeous yachts that will serve as the venue for your party. If you are planning a grand affair with a large guest list, we suggest the magnificent Grand Floridian yacht. This beautiful 128-foot yacht can easily accommodate up to 550 guests with seated dining for 240 guests on one deck. When you plan a party boat rentals event aboard the Grand Floridian, you can expect to dazzle your guests with great ambiance, comfortable contemporary décor and excellent service. This beautiful yacht offers you and your guests: four decks, including an open sky deck, covered sky lounge area, and two aft balconies, a custom full-service bar, multiple dance areas, 13 HD TV’s, state of the art media capability, elevator service and private staterooms with en-suites below deck. For south Florida yacht charters with up to 60 guests, we highly recommend the gorgeous Summer Wind yacht. This regal beauty offers great amenities, plus: three decks, a custom full-service bar, a swim platform for taking a dip in the water, lush lounge areas, state of the art media capability, and private staterooms with en-suites below deck. This regal yacht can serve as your very own private yacht for the day. Planning your event on one of our south Florida yacht charters includes selecting all the resources that will make your event extra special. Our talented event planners can assist you in making selections that include: decorations, tableware, floral arrangements, live band or DJ, custom cakes, photography, ice sculptures and so much more. You can serve five-star cuisine at your fabulous Miami yacht rental Our celebrated chefs offer a variety of ethnic menus, and can also customize a meal plan for you. Our event planners can assist you in selecting menus that include: Italian, Asian, Thai, French, Vegetarian, and more. We also have add-on stations that offer additional delectable delights for you and your guests to enjoy. All food is prepared on deck in the galley, using only the freshest ingredients, plus you can be assured that our chefs are especially diligent when preparing meals for guests with dietary or allergy restrictions. Charter One has been hosting all types of fabulous party boat rentals events since our inception in 1997, including weddings, birthday parties, charity events, product launches, holiday parties, corporate events, etc. We would consider it an honor to assist you in hosting a memorable event this year. To begin making plans for your next Miami yacht rental, contact Charter One today at: 954-771-0102.